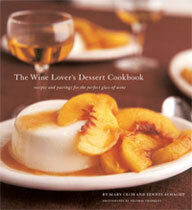 Cucina Testa Rossa: Wine & Dessert ~ Oooh la la! Wine & Dessert ~ Oooh la la! Laura -- You are so kind! Friends of Laura -- Please introduce yourself if you come so I can pass a hug back to her! Merci bien, mon ami doux. O! And as I was reading this I though that you were about to say that you'd be back in time...! But I too received the announcement today and will try and make it to at least one of the functions. That book looks like something I need to get soon. Too bad there are no signings in NYC, because I would definitely support.